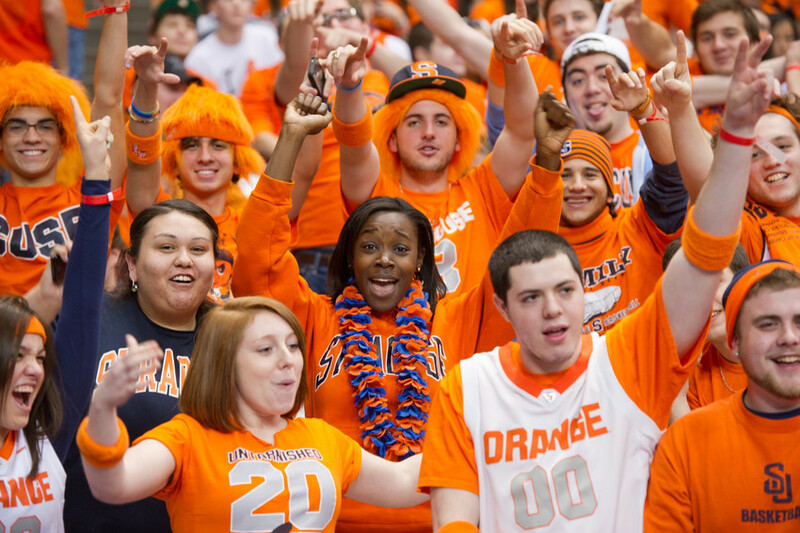 On Saturday, April 6, students have the opportunity to watch the men’s basketball NCAA semi-final game versus Michigan, and cheer on the Orange with their peers, at the following game-viewing locations and celebrations on campus. Tip-off is tentatively scheduled for 8:50 p.m.
Each residence hall will be hosting a game-viewing event. Students are encouraged to check with their resident advisors to learn more or look for news on their residence hall Facebook page. The game will be shown on all six big-screen televisions and on a large screen in 201ABC. Free food will be available for students in attendance. The dining center will also feature gameday food specials for purchase and will remain open until midnight, operating on regularly scheduled hours. The game will be shown on the televisions and on the large screen in the Schine Dining Center, which will adjust its hours and remain open until the game concludes. Gameday food specials will be available for purchase through halftime. The game will be shown on the six big-screen televisions and gameday food specials will be available for purchase. The food court will remain open until 3 a.m., operating on regularly scheduled hours.